Digital Summit Chicago Part 2: Be cautious of testing too many tactics at once. I recently attended the Digital Summit Chicago with a few other C-Kers (check out the blog my friend Colin wrote). The Digital Summit is a place for brands and thought leaders to share how they are making waves within today’s digital marketing space and I want to share three themes that stuck with me from the event. 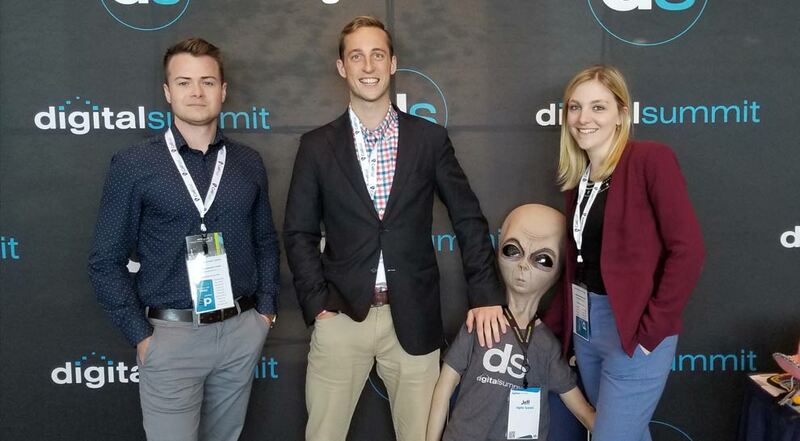 Tim Ryan (left) and other C-Kers at the Digital Summit Chicago. As voice applications rise – so will the competitive nature of search. I feel like I don’t go a day without hearing someone yell “Hey” or “Ok” at a smart device. As ridiculous as it may sound at times, digital experts at the Digital Summit predict that voice applications hold a prominent place in our future. On a recent commute home, a person seated in front of me spoke into their headphones, “Book me a movie ticket for tonight at 7:30.” I thought to myself, “No way their phone is doing that.” After taking a somewhat rude but quick peek, their device had actually linked directly to Fandango and booked tickets at the nearest theater. There are hurdles that voice search will have to overcome as it becomes more prominent in the marketing industry. As of now, there is a lot of work going into narrowing desired searches from an entire web page of results to only one result. At C-K, where we consistently rely on search to drive results, we are preparing for new ways to ensure success with this new format. If you want to read more about preparing your brand for voice search, check out this blog by VP, Search Director Nick Papagiannis. You may be trying too much at once. While the digital space is excitingly dynamic (for example, in a matter of a few hours, I attended back-to-back sessions on content, analytics, UX & design, and B2C marketing), in many sessions, I found myself being warned not to try every single new marketing trend at once. Doing so can often spread resources too thin while letting valuable insights from previous efforts fall by the wayside. So, what does this mean for a busy company and team like C-K? Yes, we want to do the most for our clients and keep tactics updated. Yes, the constant pressure to adapt to digital trends is present now more than ever. However, we will have to continue advising our clients to maintain a healthy balance of new strategies with top performing historical methodologies. AI is taking a stronger foothold within marketing. AI was a popular subject at the conference, for good reason. It’s bridging the gap between data assembly and data application. Pharmacists are using it to predict and prevent medical errors. Lawyers are using it to predict what documents are the most relevant to cases. And, marketers are using it to build personalized dynamic messaging across their digital efforts. AI is also evolving what it means to do what I do as a media planner. In the near future, we’ll use AI even more efficiently to segment audiences based on super detailed consumer journey insights that will allow brands to connect with the right person, at the right time, with better-than-ever personalized messaging. All of this sets the stage for more efficient uses of time and client dollars. While keeping in mind the lesson of not trying too many tactics at once, I look forward to putting some of my Digital Summit learnings into action.